Look what’s back in my Etsy shop! I’m bringing back Last Dollar Comics! It’s been a while since I’ve done a new book and I’m hoping I will have a new one for Ithacon in March, but for now, you can get an oldie but a goodie in my shop! The kid’s at Miss Crabtree’s Pre School are tasked with a r cycling project. 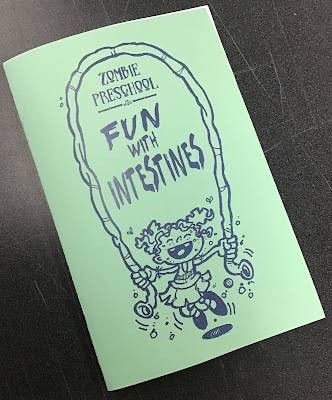 What do you do with left over intestines? Find out in this gruesome little mini comic sure to bring a hideous little smile to your face!